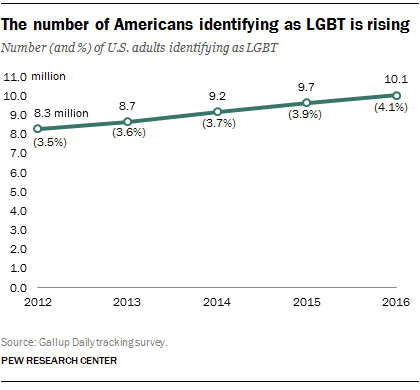 1 Americans are becoming more accepting in their views of LGBT people and homosexuality in general, and the number of people identifying as LGBT has grown in recent years. For example, 63% of Americans said in 2016 that homosexuality should be accepted by society, compared with 51% in 2006. LGBT adults recognize the change in attitudes: About nine-in-ten (92%) said in a 2013 Pew Research Center survey of adults identifying as LGBT that society had become more accepting of them in the previous decade. 2Bisexuals make up the largest share of LGBT Americans. An analysis by UCLA’s Williams Institute in 2011 found that bisexuals accounted for about 1.8% of the total U.S. adult population at the time. 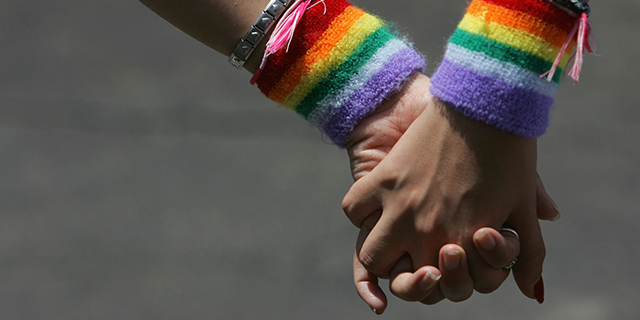 A slightly smaller share (1.7%) were gay or lesbian. And the latest Williams Institute estimates, from 2016, find that 0.6% of U.S. adults, or 1.4 million people, identify as transgender. 3Gay men and lesbians are more likely than bisexuals to be “out,” according to the 2013 Pew Research Center survey. Overall, only 28% of bisexuals say that all or most of the important people in their lives are aware that they are LGBT. Meanwhile, 77% of gay men and 71% of lesbians say the same. Bisexual women are much more likely than bisexual men to say most of their friends and family know about their sexuality. 4Most LGBT Americans say they have never lived somewhere that is known as an LGBT neighborhood. According to the 2013 survey, 72% say they have never lived in one of these neighborhoods, while 14% say they have lived in one in the past and 12% say they currently do. While 56% say it is important to maintain places like LGBT neighborhoods and bars, 41% say these venues will become less important over time as LGBT people are more accepted into society. Gay men are the most likely of any of the LGBT subgroups to say that these distinctive venues should be maintained (68%). 5 There are demographic differences in who identifies as LGBT. The most notable is by age. 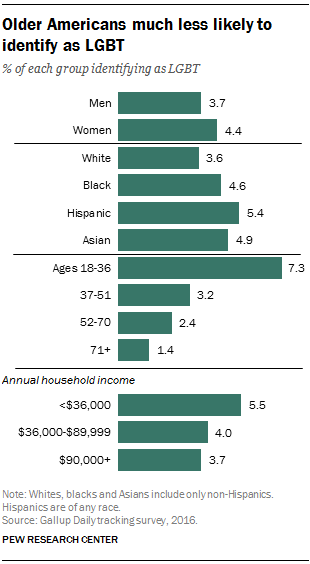 Young adults, ages 18 to 36, are by far the most likely to identify as LGBT (7.3%). By contrast, much smaller shares of those ages 37 to 51 (3.2%), 52 to 70 (2.4%) and 71 and older (1.4%) say they are LGBT, according to Gallup.